Tim's Miniature Wargaming Blog: Countdown to Vimy – 9 weeks to go! 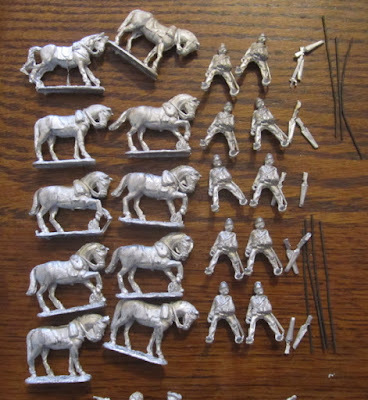 Monday I cast just over 100 Great War Germans to make up the rest of the Germans I’ll need for the project – plus a few extra, in case I hadn’t counted right or I noticed any terribly miscast figures after the fact. 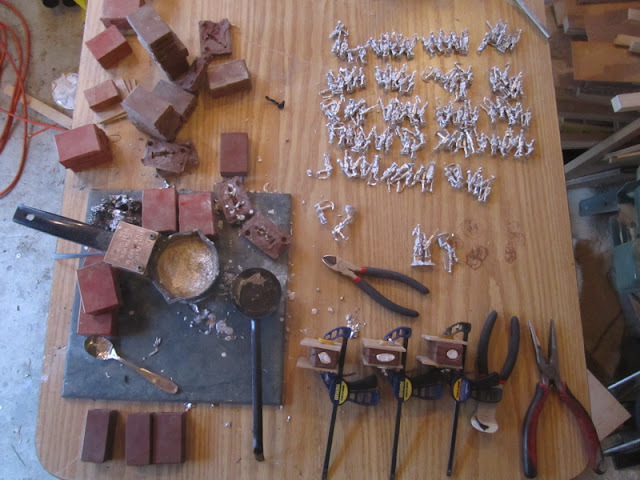 I thought I’d taken pictures of the workbench during the priming/gooping process… but apparently I didn’t. Anyway, I DID get them all primed and enough of the ones I actually need to do gooped. They didn’t arrive on Tuesday – some mix up with import papers, sender not assigning broker or UPS being confused about something... Held up in Winnipeg. Or Wednesday… Still in Winnipeg. 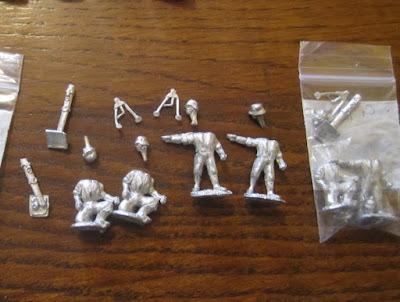 I also ordered a bunch of Machine guns and mortars and artillery from Irregular Miniatures because… well.. they are cheap – like less than half the cost of the any other mortar or MG teams from any other manufacturer – and I’ve gone WAY over budget for games and toys this past year. You get what you pay for though – the German and British MG teams are basically identical – they just have different helmets (and some minor modifications to the guns, I noticed when I actually assembled them). The Mortar teams were the same – these they didn’t even cast separate crew with different helmets – they just have a generic crew with separate heads! That doesn’t matter so much – they’re in shirtsleeves and puttees and minimal equipment – the crew will probably look alright when they’re done – what was really disappointing (which any of you that know anything about Great War Equipment will have no doubt already noticed…) was these mortars they have come equipped with. The German trench mortars of the Great War ( the Minenwerfer did not look anything like Stokes mortar or any of the tripod mortars used by most nations by the Second World War…. I know, both sides made use of captured equipment, but I don’t think it was done on a large enough scale that it would be reasonable to produce this as the only option for the Germans… I’m not sure if I’m even going to use these. I do have four Mortar teams… I’m not really sure how many I was thinking I needed? One per regiment, is that what I was going for?! They’re not going to be a priority - I have four other much nicer ones, three of which are complete. 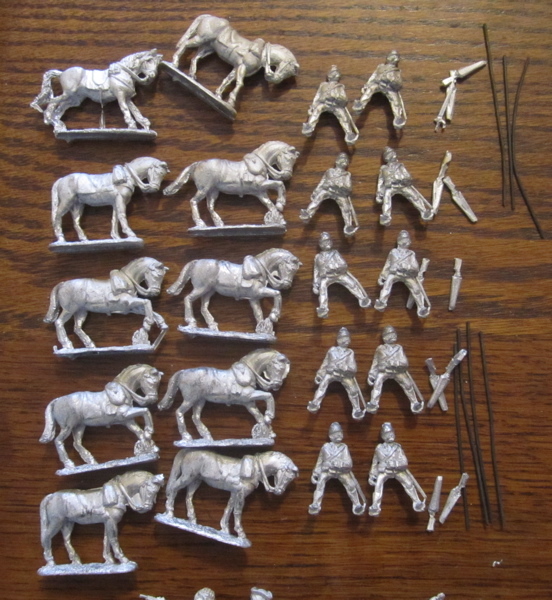 And then there’s the Turkish Cavalry I ordered… oh, don’t get me started about them. I did get the Machine-gun teams assembled and based yesterday. Hopefully I’ll get to the Mortar teams today. I did start reorganizing them. This is the first part of that. On the left we have three regiments of Bavarians – they are not all part of the same Division. In the front is the 11th Bavarian Infantry Regiment (part of the 16th Bavarian Reserve Infantry Division), which held the north end of the Ridge and “The Pimple” just to the north. The other two Bavarian regiments (Bavarian Reserve Infantry Regiments No. 1 and No. 3) were part of the 1st Bavarian Reserve Infantry Division which held the area at the south of the ridge. In the center are Reserve Infantry Regiments No. 261, No. 262, and No. 263, which were all part of the 79th Reserve infantry Division which held the center of the ridge. 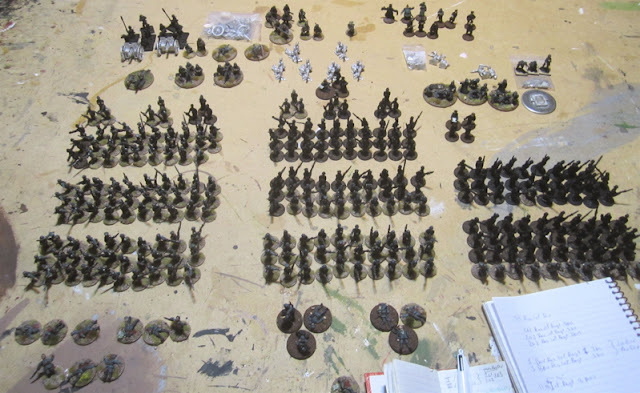 On the right are a bunch of extra regiments I cast, primed and (mostly) gooped to field as a few of the reinforcement battalions that appeared on the day – I actually only need four of them. In front are a few casualty/morale failure markers, in the back are an assortment of achine-gun and mortar teams, field guns and higher command figures all in varying states of completion. 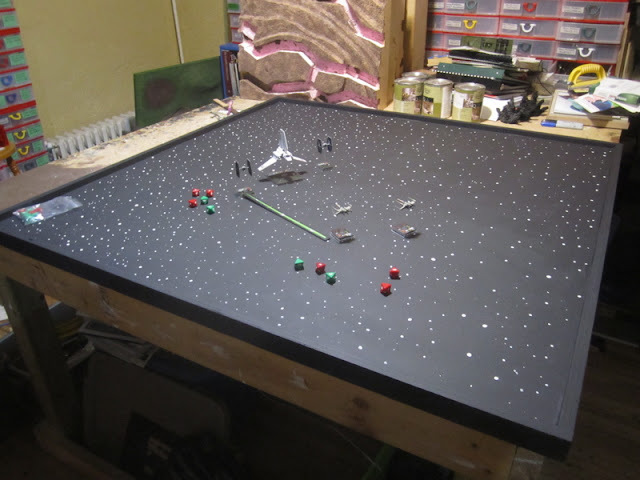 One thing I’ve been meaning to do for a LONG time once I got the table cleared off was to make a star field battle board for various spaceship battle games. This didn’t take a LOT of time 15 minutes per coat of black (x2) and about 20 minutes to do all the stars. Then board itself was one of the DBA Game Boards I made five years ago. 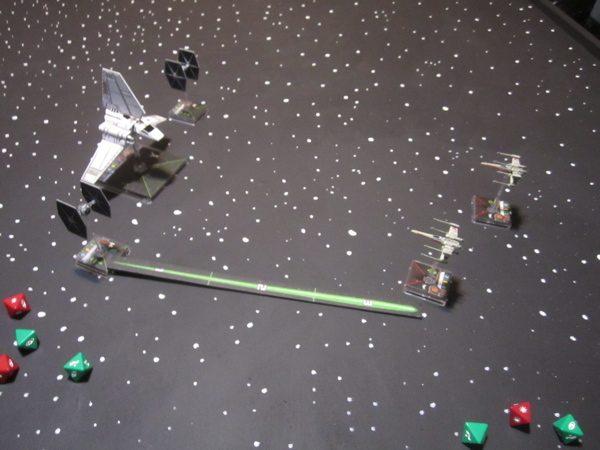 I think I made four of them for use during campaigns, but in all the HOTT and DBA campaigns I ran I don’t think we EVER used all the boards in one campaign turn, so one is beign repurposed for battles among the stars! Did I overdo it on the stars…? I’m not sure. 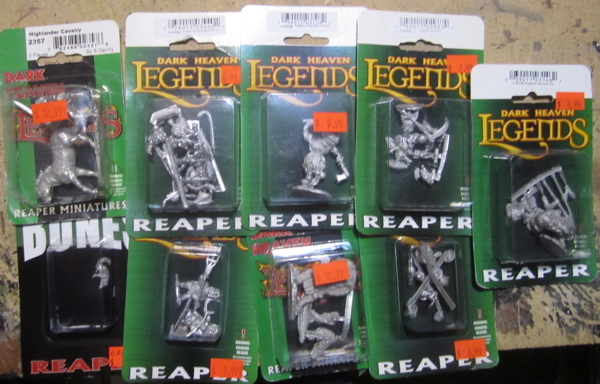 My local game store (Dragon’s Den Games) is having a 50% off sale on Reaper Miniatures metal miniatures. 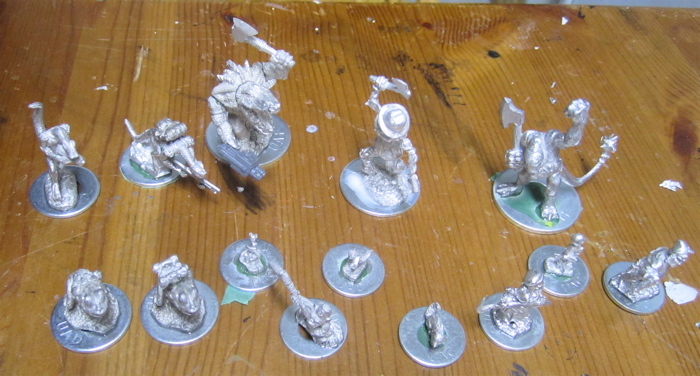 So I went and picked up a few weird things – mostly anthropomorphic animals and plants to use as mutant plants and animals in Mutants and Death Ray Guns (which I have become a bit obsessed with lately…) plus a pack of familiars and halflings and such. 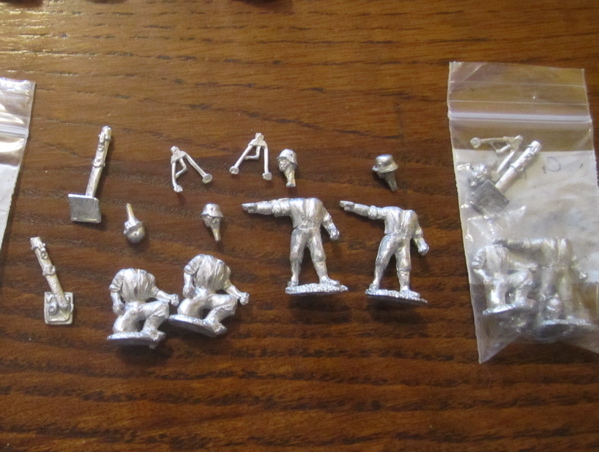 I even started basing and assembling/converting some of them last night (as a “treat” for getting all the German infantry based and primed and machine-guns based…) - there is also a pair of old RAFM REptiliads and an old Citadel Firmir I assembled along with them. 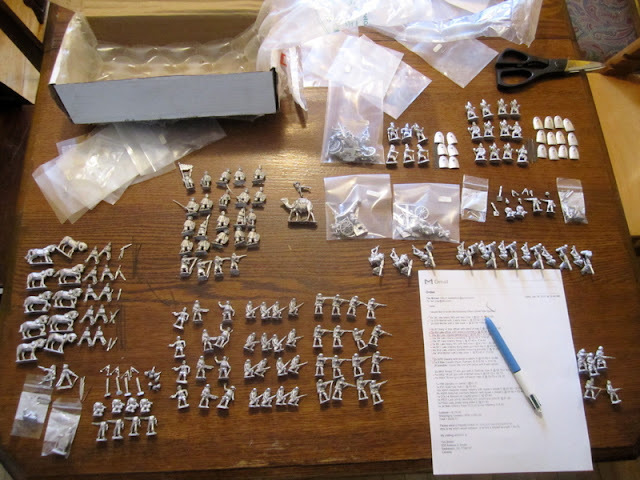 #1 Paint ~45 Great War Germans to add to those painted last week and reorganize into 10 figure battalions to form the 3 regiments of the 79th Infantry Division. Build Terrain for 3rd Division. Congratulations on the progress! Your output is truly amazing. I'm hoping to finally finish my 2mm ACW tonight and that's been quite a few years coming. I just noticed this is the 1500th post on this blog! Congratulations! Impressive output, irregular minatures, you really do get what you pay for, generic stuff is ok I got a few cannons from the great Italian wars they were the cheapest of any manufacturers but needed a bit of work but alright. Your doing well on Vimy keep it up!